You rarely see those two words together, “healthy” and “holiday”. Don’t get me wrong, I love butter and cream and most things fatty and I don’t skimp on the chocolate either, but it is nice to find a refreshingly light dessert that also has wow factor to go with it. These little bursts of sunshine come from Martha Stewart’s December Living, the mysterious magazine subscription I started receiving after admitting to stealing a recipe out of one at my hairdressers. No one has come forward to admit sending it to me yet, anyone? Anyway, these looked so interesting, I had to give them a try. The recipe calls it “Clementine Granita”, but I used mandarins and it worked out well and I didn’t need the extra 12 for juicing that the recipe called for. It also suggests 3 per person and I only made enough for 1-2 per person because I was feeding a big group and it was just fine. It’s a lot of scooping if you have a big party, so know that you can go with smaller portions. I made these the day ahead of serving and then put them together when it was dessert time fairly quickly with a 5 minute refreeze before serving. I don’t think I’ll make them for my Christmas feast, but they’re perfect for one of those in between special dinners where everyone can use a break from cookies and rich desserts, but still want to feel spoiled. If you don’t want to juice enough clementines to make the 2 cups juice needed, you can use orange juice to make up the difference. When I used mandarins, I only needed 1/4 cup orange juice to make up my 2 cups without juicing any extra above the original 12 and the flavor was brilliant. Slice the top 1/2 inch off each clementine/mandarin and set aside. Cut around flesh and scoop out into a sieve set over a bowl. Reserve skins and be careful not to tear them. Press flesh to extract juice-it worked best to use my hands for this, messy but satisfying! Squeeze in juice from the tops as well. Juice more clementines or mandarins to make up 2 cups or add orange juice as needed. Moisten skins with water or juice and roll them in 1/4 cup of the sugar to coat. This is just for decoration, so they don’t need to be perfect. It just adds a little sparkle to the dish. Freeze until solid, about 2 hours. Meanwhile, bring remaining 1/4 cup sugar, the water and ginger to a boil in a saucepan, stirring, until sugar dissolves. Remove from heat, cover and let stand for 30 minutes. Discard ginger and stir in the 2 cups juice and the lemon juice. Transfer to a non-reactive 8-inch square baking dish and freeze until solid, about 3 hours. This can all be left in freezer overnight until you’re ready to serve. 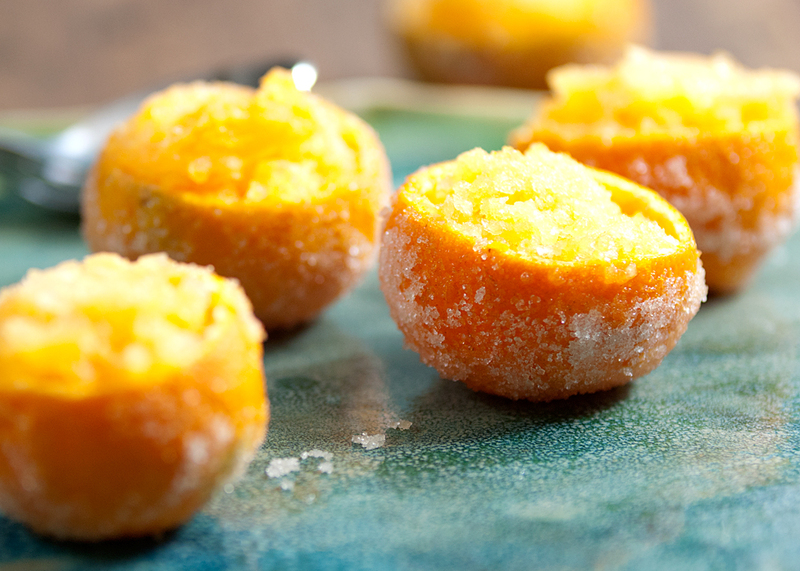 When ready to serve, scrape granita with a fork to fluff and spoon granita into clementine/mandarin “cups”. Freeze for 5-10 minutes before serving. This entry was posted in desserts and tagged clementine, mandarin.